Over the past year as I would research books to read and add to my Kindle Wish List, I kept coming across Ender’s Game and the thousands of five star reviews it had garnered. It was obvious that this 1985 novel by Orson Scott Card had become a cult classic. Still, I was hesitant to read it because like The Hunger Games, it was classified as both YA (Young Adult) and science fiction, two areas that don’t terribly interest me (The Hunger Games Trilogy excluded). About two weeks ago, I finally pulled the trigger and added it to my books on my phone.As it turns out, I enjoyed Ender’s Game. It was creative, unique and it held my attention. It requires that you sort of suspend belief but that’s OK, too. Ender Wiggin is a six year old tactical genius recruited by the government to go through an intense multi-year training program in the hope of developing leaders who will be able to destroy the “buggers” and save the Earth. There had been two previous massive wars with these alien ant-like creatures and everyone agrees that the earth was victorious only through some dumb luck. It’s a tough life for young Ender as he is separated from his family and secluded for the most part even from his fellow recruits. Ender distinguishes himself at the Battle Camp and is clearly the one recruit who is head and shoulders above the other. Do we in the war or is the Earth destroyed by these invaders? You will just have to read Ender’s game for yourself to find out. I will tell you it is worth reading. 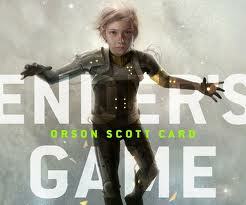 Ender’s Game will be released as a full length feature film in November of 2013. It will be interesting to see if it has the same strong following as The Hunger Games. Meanwhile, I gave this book four stars.